So you’ve decided it’s time to refresh a room or entire house with a repainting and maybe change up the colour scheme. You assume you are ready to paint, but before you even think about dipping that paint brush you’ll need to get the room or rooms ready. The proper surface preparation is key to a professional painters look and long lasting finish. So grab your painting tools and let’s get ready to paint and roll. Before you begin your own DIY house painting there are a few things to know in preparing a room before you get started. If you’ve hired a house painting company then they’ll take care of most everything with their home painting services . Some of these tips will serve you the homeowner to prepare the room before the painters arrive and get started on painting your house. 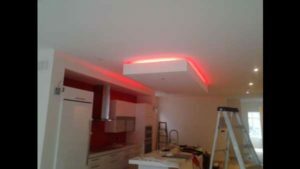 All these tips will be beneficial to the homeowner and the painter to move things along efficiently and achieve good results in the end process. 1. Clear the room Move any furniture, lamps, and accessories into the middle of the room. Remove any wall art, pictures from the walls. Everything can be compiled into a group in the middle and covered with protective covering. The more space you give to the painter the easier it is to get the painting done efficiently. 2. Remove electrical covers Use a plastic container or an old shoe box. 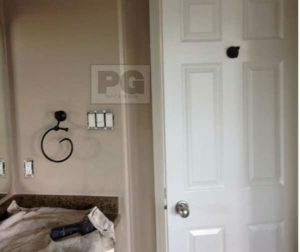 Unscrew every light switch plate and electric plug receptacle cover in every room that painting will take place. This alleviates having to individually use painters tape on every one of them and gives clear access to the painter without the need of being overly cautious. 3. Cover the floors Purchase a big roll of painters plastic cover, this way you can simply throw it away once the painting is complete. If you want to invest in professional painters drop cloths then note that they are more expensive, You can also use both to ensure a leak proof protection to any floor surface. 4. Clean before you paint Wipe down all baseboards, trim and window frames. 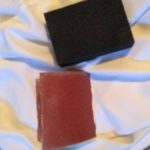 Using a damp cloth with a small amount of dish soap usually does the trick. This ensures all dust, cob webs and any dirt is removed and the paint will adhere better to the surface. You can paint over the dust and cob webs but note that you may have new details like that dust ball or spider caught up in the web on your walls or baseboards that you may not have wanted as part of your home decor. By the time you’re ready to start painting the surface will have air dried and be good to go. 5. 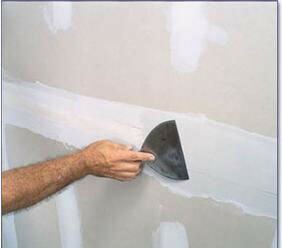 Drywall Repairs Fill any nail holes, pops, crack or imperfections. 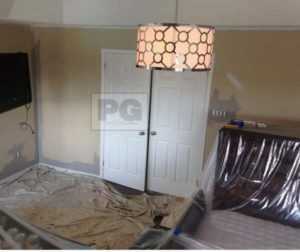 Using a simple premixed compound to fill the imperfections and repair the drywall and then a light sanding to make a smooth finish will give you the perfect base to begin painting a primer. 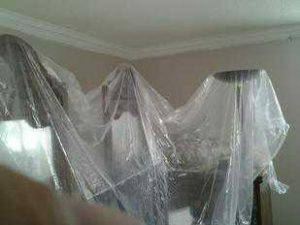 See all our house painting tips for more details and how to information. 6. Caulking Fill all the gaps and cracks that are between the woodwork, the ceiling and the walls. Filling these gaps between the crown moulding (a.k.a.) 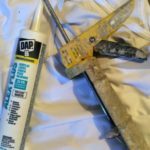 cove moulding in the ceiling, the trim around the windows and doors and the baseboards ensures a crisp finished paint job and helps avoid paint and caulking problems Using the caulking tube and gun squeeze enough into the gap and then smooth it out with your finger. Have a damp rag ready to use on any excess. 7. Painters Tape If you are DIY painting then invest in a roll or two of painters tape. 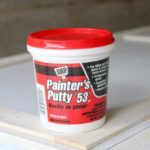 Use it around the glass on the windows, light fixtures and masking off the baseboards as this will ensure you cut and paint a straight line with a paint brush. 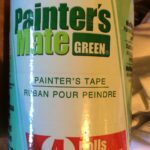 Apply a thin coat of paint along the edge of the tape and remember to not over load the paint brush when cutting as some paint will leak through the tape. Ensure the paint is completely dry before removing the painters tape or the paint will peel off with it. That’s pretty much it just to get started on your own house painting. It can become overwhelming, but rest assured there’s always a professional house painter nearby, who can help you achieve the perfect end paint results. These tips can be useful to follow when preparing your room or house for painting. Step 1 is also helpful to a painter you may be considering to hire as your professional house painting contractor. If you’re up to it get ready as it is tedious, time consuming and not as easy as some may think. 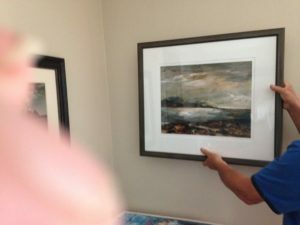 There’s always a professional house painter in Ottawa that you can rely on to get all your house painting done efficiently, professionally and at a reasonable cost. Contact your local Ottawa painting contractor near you.